Floyd’s Body Shop's fish depicts their logo of two auto body men pulling the dents out of a vehicle because Floyd’s “takes the DENTS out of ACCIDENTS.” And they have been doing just that for 47 years! 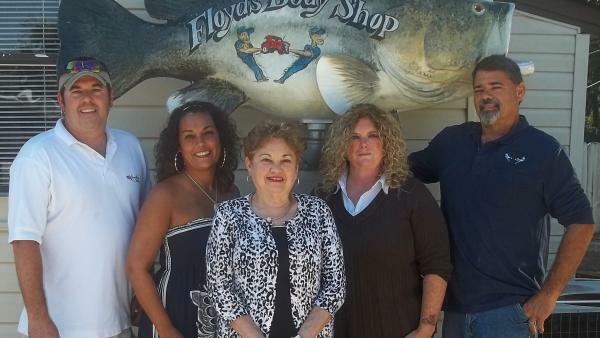 Steve Floyd founded the business, and Floyd’s has been family-owned and operated ever since. Floyd’s Body Shop makes fixing your car as easy as possible. They offer 24-hour towing and do free estimates for all insurance companies. Their 12-bay garage allows them plenty of space to get vehicles in and out as quickly as possible for customer convenience. They have literally painted everything from a tricycle to an airplane! Floyd’s guarantees all of their work, ensuring customer satisfaction. In fact, customers have come all the way from Washington, DC, for Floyd’s quality service! That top-notch service has been reflected in several awards, including the AutocheX Premier Achiever Award for August 2011-August 2012, nomination for the CarQuest Excellence Award, Who’s Who in Executives and Business Awards, and the Roanoke Rapids Daily Herald 2010 Best of the Roanoke Valley Award to name a few.